Tonight at a special developer round table, Nintendo offered up some information regarding playing with other gamers in Pokémon X and Y. In addition to being able to link up with friends locally for trading and battle, X and Y features a new mechanic that will allow players to interact globally. It's called the P.S.S. (Player Search System), and it's active whenever you're connected to Wi-Fi and playing the game on your Nintendo 3DS. Regardless of where you live, whether in a densely populated city or good ol' Delaware, you'll constantly find a populace of other players to interact with. When activated, the P.S.S. will sit on the touchscreen of the Nintendo 3DS. There you'll see players grouped into three categories: Friends, Acquaintances and Passersby. Passersby are other gamers online playing Pokémon X and Y. You can hook up and interact with any of these folks whenever you want. Acquaintances are players that you've interacted with before. When you work with an acquaintance more than once, you'll be given the option to turn them into Friends. From there, you'll also be able to turn 100 of these folks into favorites, those that you want to interact with all the time. As for how your existing Nintendo 3DS friends will blend into this system? Friends from your friend list will automatically be in the Pokémon X and Y friend list as "Friends." A huge emphasis of tonight's presentation was placed on the evolution of communication within Pokémon. 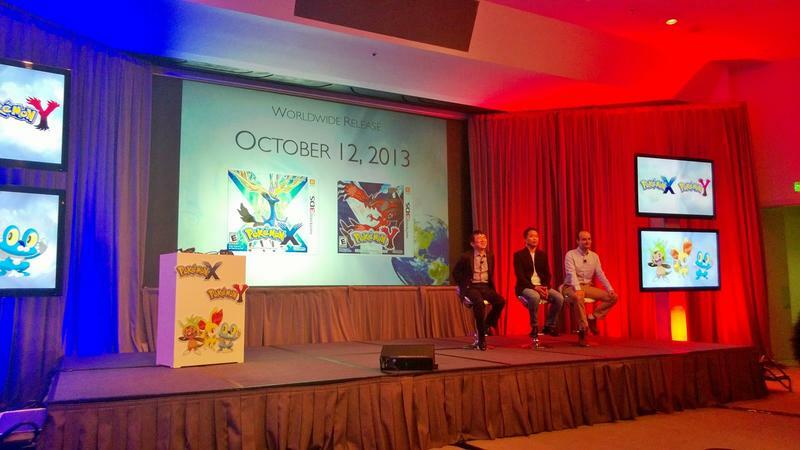 X and Y looks set to carry the torch forward. The game will release globally on October 12th, 2013.